Kazakh nomads have been grazing their livestock near the Altai Mountains in western Mongolia for many hundreds of years. Here, in this desolate landscape, where temperatures plummet to minus 40 degrees Celsius in winter, live the last of the men who use eagles to hunt on horseback. Rugged, formidable, proud, the golden eagles share the same qualities as the men with whom they ride. Only the toughest survive here. Fascinated by the special bond that develops between hunter and eagle, photographer Palani Mohan has spent the last four years documenting the burkitshi, as the hunters are known in Kazakh. There are no more than 50 to 60 ‘true’ hunters left, and each winter claims a few more. Having taken a pup from the nest, given it pride of place in their home and trained it, all hunters describe the eagle as part of their family. With its massive wingspan, sharp eyesight and powerful, flesh-tearing beak and talons, the golden eagle is the perfect predator. Its usual prey, fox, provides a welcome meal for the hunter’s family, while the pelt can be made into warm clothing. 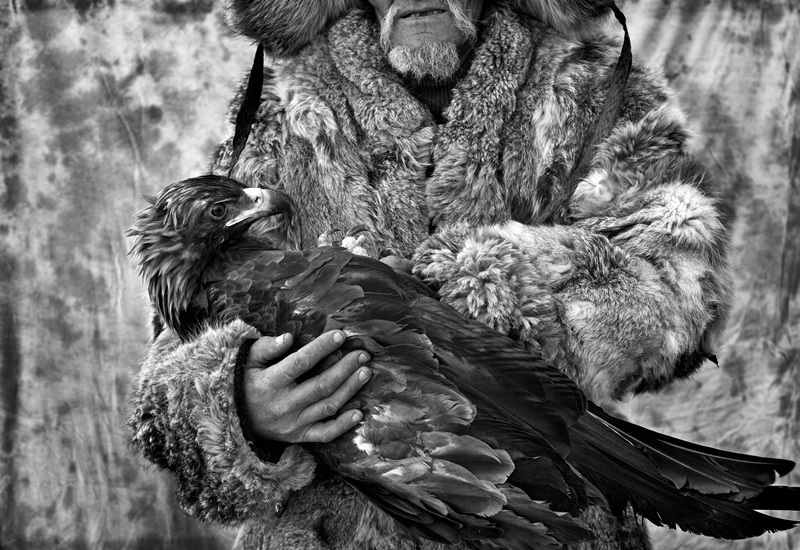 Mohan’s photographs of the stark landscape, the isolation of the hunt, and most of all the trusting relationship between man and bird, convey the huge importance that the eagle plays in the lives of the last remaining Kazakh hunters. This is an timely record of these noble men and their majestic eagles in an unforgiving part of the planet before they disappear. Limited copies of Hunting with Eagles photobook will be available for sale, and for each book sale, 10$ will be donate directly to Anjali House. Indian born, Australian raised, and now living in Hong Kong, Palani Mohan’s work has been widely published by many of the world’s leading publications. He is the author of four books and has just completed his fifth, on the Eagle Hunters of Mongolia, which will be published in September 2015. His work is part of the collection of the National Portrait Gallery in London and his images have been shown widely around the globe and he has been recognized with awards including World Press Photo, Picture of the Year International, CHIPP, Communication Arts, and Sony International.